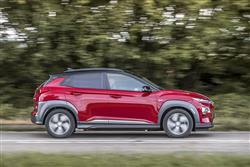 The Hyundai Kona Electric re-defines the kind of proposition we'd previously got used to affordable full-electric cars being able to provide. The 279 mile WLTP-rated driving range figure of the top version shames the market-leading Nissan LEAF, yet the price being asked here isn't much different. The game just moved on. 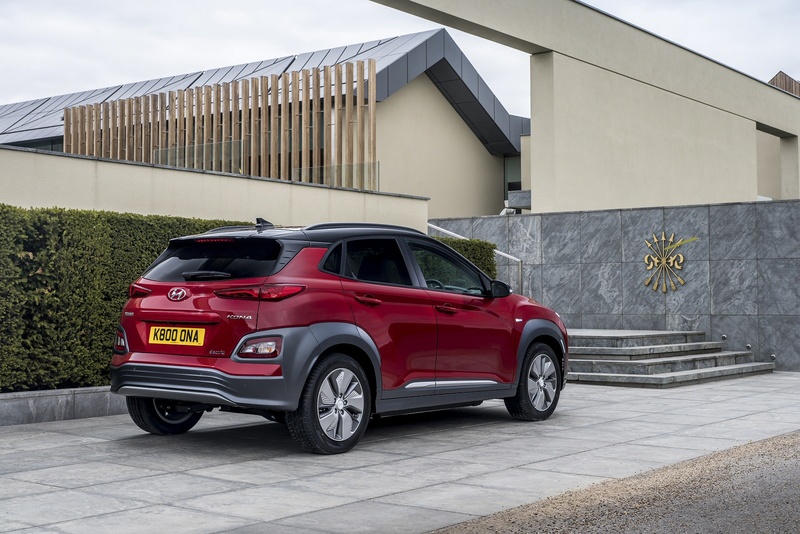 Prior to this Hyundai's arrival, the full-electric car market was pretty much divided into a couple of kinds of contender. There were relatively affordable ones, like the Nissan LEAF, developed steadily to the point where their lithium-ion batteries can offer up to around 180 miles on a good day. Or for around twice the money, buyers can graduate to the more sophisticated battery technology that luxury models use - cars like the Jaguar I-PACE, the Audi e-tron, the Mercedes EQC and various Teslas. With these, a driving range of around 300 miles or more is the norm. This Kona's chief selling point is that it offers the kind of range you'd get in a luxury EV for the kind of price you'd pay for a more affordable one. As selling points go, that's a pretty strong one, though unfortunately for Hyundai, it isn't an exclusive attribute. 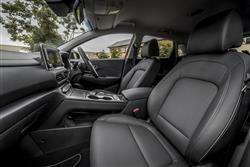 All the same engineering that features in this car can also be found for a similar price in its cousin, the Kia e-Niro. 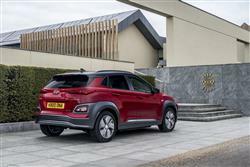 That car's also a compact SUV but is much less overtly styled as one, leaving this Kona probably better placed to capitalise on the market's current craze for Crossovers. Let's put this car to the test. The way this car hurls itself away from rest is pretty surprising the first time you experience it. Once you understand the drive dynamics here though, the rush of blood to the head that this Hyundai gets every time you press the loud pedal with any real vigour is only to be expected. There's a lot more pulling power than would be generated by an equivalent combustion engine - 395Nm of torque - and all of it's delivered to you right from the get-go, rather than building, as it would do with a fossil-fuelled powerplant. 62mph from rest takes 9.7s in the entry-level 39kWh version, which has a reasonable WLTP-rated 180 mile driving range between charges. But most Kona Electric customers are going to want the 64kWh variant we're trying here, which manages a WLTP-rated range of 279 miles that sets a new standard amongst affordable EVs. Conserving that driving range requires careful management of the energy regenerative process that kicks in when you come off the throttle. Like some other EVs, this one provides you with paddleshifters behind the steering wheel that allow you to either intensify or reduce the regenerative braking feel. Alternatively, you can automise things using a 'Smart Regenerative Braking System' that constantly calculates the optimum level of braking regeneration, based on the positioning of vehicle ahead. On the open road, this car struggles a little with weight (it's 300kgs heavier than a conventional Kona) but the even distribution of the battery pack across the floor plan helps with handling and a more advanced independent rear suspension set-up has allowed the engineers to deliver a decent quality of ride. When Hyundai created its first mainstream electric car, the IONIQ, it started from a clean sheet of paper. 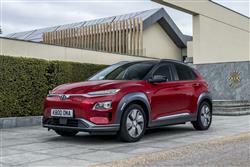 But with this Kona Electric, the company's keen to show that EV design can be just as effective when it uses a shared platform and body shell with combustion-engined cars. It helps that the model in question here is a high-riding SUV, so the batteries can be packaged in more easily without affecting cabin space, spread across the floorplan for a low centre of gravity, as they would be in a Tesla. At the wheel, key change lies with the installation of this wider aircraft-style silver-trimmed centre console, which incorporates the 'shift-by-wire' push-button controls for the single-speed auto gearbox. 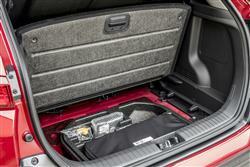 And additionally includes a useful extra storage area in its lower section. Also quite different is the single-dial instrument binnacle, flanked on the right by an information screen and on both sides by EV read-outs. 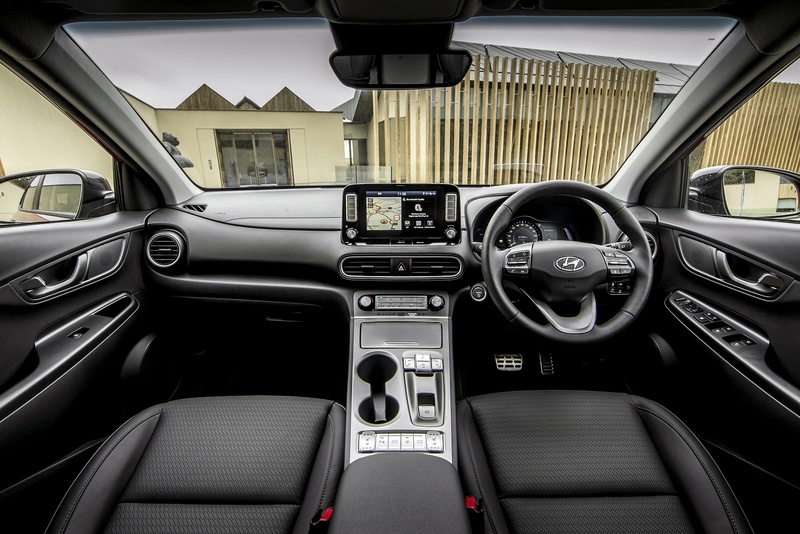 Everything else you'll need to know will be on this centre-dash screen, 8-inches in size on most variants, with mapping functionality that integrates into range read-outs and helps you to locate nearby charging stations. And in the rear? 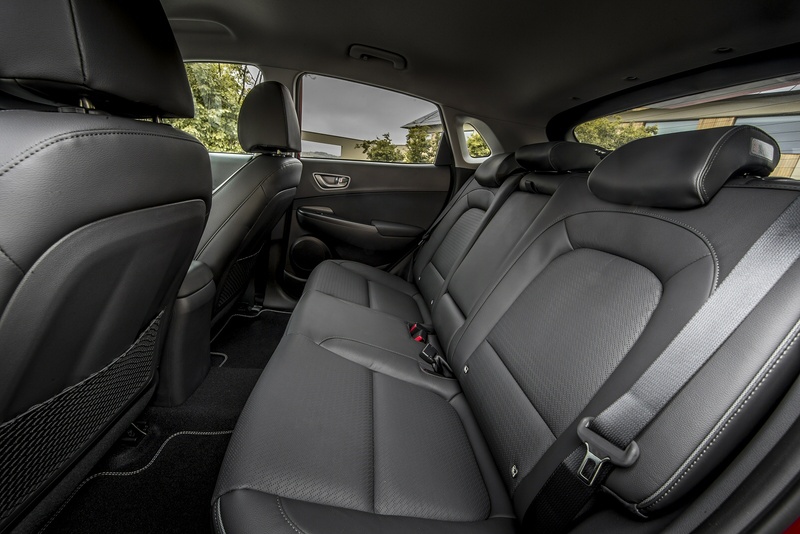 Well it's in this part of the car that you're likely to be most keenly reminded that you've bought an SUV based on a supermini-sized platform, rather than that of a family hatchback. The same applies to the capacity of the 332-litre boot. 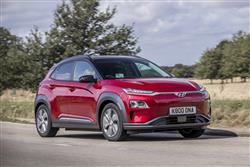 What Hyundai's EV competitors were expecting here was a fairly straightforward proposition: an on the road price in the £27,000-£29,000 bracket, battery capacity around 40kWh and 180 miles of WLTP-rated driving range. 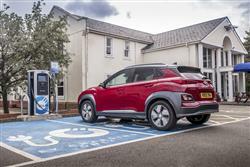 And indeed, that's almost precisely what's delivered by the base 39kWh version of this Kona Electric, which is offered in two guises, 'SE' and plusher 'Premium', with an extra cost of just under £1,500 to go from one to the other. 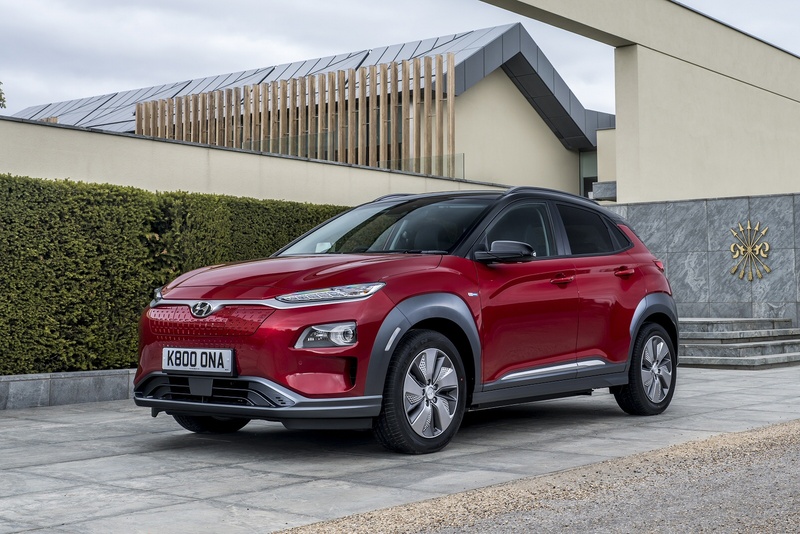 What the market wasn't expecting was the version of this Kona Electric that we're trying here, the 64kWh variant that almost all customers of this battery-powered model will want. With this top derivative, there's 279 miles of WLTP-rated range for around £33,000 (if you go for a 'Premium'-trimmed model) or around £35,000 (if you go for the top 'Premium SE' variant we're testing today). 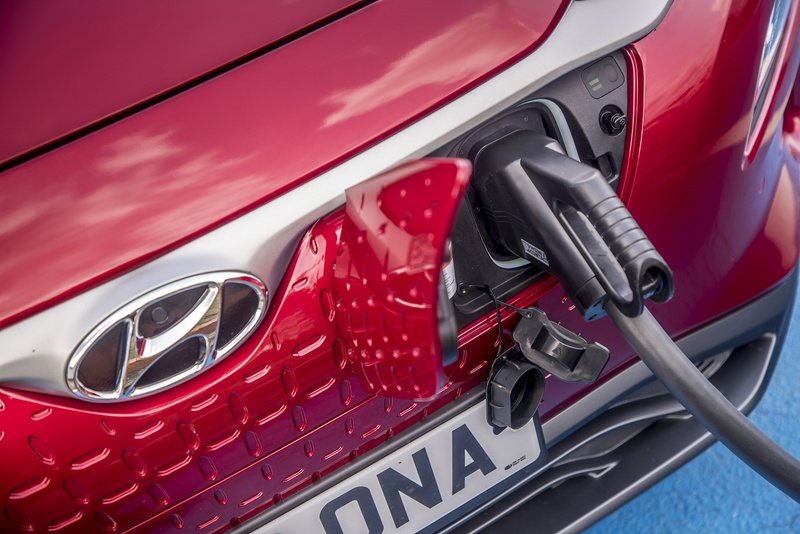 All the prices we've just quoted you include subtraction of the £3,500 government grant provided towards purchase of full-EV vehicles: as you may know, the government no longer offers grants for Plug-in hybrid models. Hyundai claims the grant on your behalf, so you just pay the subtracted figure. 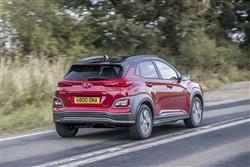 We say 'Hyundai' rather than 'your local dealer' because at the time of this test, the only way to buy a Kona Electric was through Hyundai's national website. To give you some Kona range perspective, we'll tell you that if you were to choose a conventional 1.6-litre CRDi 136PS diesel version of this Kona model, you'd be paying somewhere in the £20,000 to £25,000 bracket, depending on the specification chosen. As usual with an EV, you get plenty of cabin screen options to allow you to plan your route around your remaining available charge. 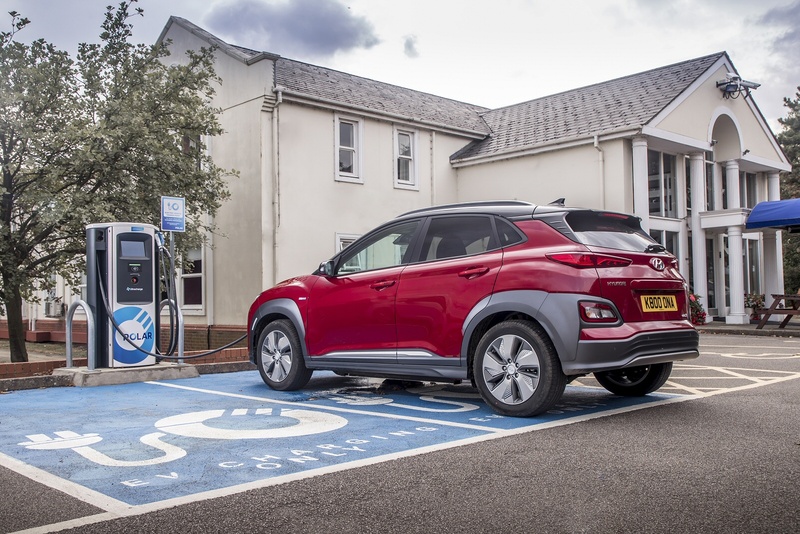 When it's depleted, you'll be able to recharge your Kona Electric to 80% of capacity in just 75 minutes if you can find a 50kW DC CCS charging point. Most of the time though, you'll be charging this Hyundai overnight using a 7kW wallbox that you'll have to pay a little extra to get installed in your garage. In the 64kWh model. You can revive the cells from empty in this way in around 9.5 hours (which would use around £9 of electricity at current rates). It would take just over six hours if you were to go for the 39kWh model. Of course, to maximise your driving range, you're going to need to make copious use of the various driving aids Hyundai provides. There's a power meter driving gauge to the left of the speedometer in the instrument binnacle and the idea here being to keep the needle in the 'Charge' band as often as possible. There's also a 'Driving Style' section in the trip computer screen that can display to the left of the instrument binnacle and award you percentage readings for 'Economical', 'Normal' and 'Dynamic' progress. If you�re looking for a new Hyundai Kona 150kW Premium 64kWh 5dr Auto Electric Hatchback for sale, you�ve come to the right place. At Bristol Street Motors we don�t just have the best Hyundai Kona 150kW Premium 64kWh 5dr Auto Electric Hatchback deals, we also offer friendly advice and help with all your enquiries to ensure your buying experience is a happy experience.